I have been working like a crazy person trying to finish Caleb's three year book. My coupon for a free book expires in just a few days. I am ALMOST done. I have three more layouts to complete and then just a check of each finished layout to make sure they are all just the way I want them in the book. Then I will upload them all to Shutterfly and order a book for me and one for Caleb's parents. WHEW! So now it's time to show you one of my favorite layouts. I hope you like it. I'll share more once my book is complete. 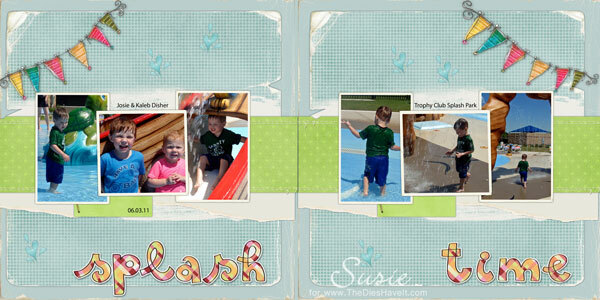 I spent an entire retreat weekend choosing and editing pictures and templates for each 2 page spread. By the time the weekend was done, I had pictures in 36 double page layouts. Then during a scrapbooking cruise, I spent all my scrapbooking time adding in papers to each layout. To be honest, after the cruise, I changed out some papers. I may have been distracted by all the food on the cruise because some of the papers were weird. Yes, I am sure that's the reason. Then yesterday I spent twelve straight hours adding in embellishments, journaling and shadows. I love to digi-scrap, but it is NOT a time saver for me. I am just as slow in digi as I am in paper!! But I love it. I can't wait to see my finished book! If you come back tomorrow, I'll have a fun card to share with you.